Calendar time is one of those things that started with older children and was pushed down to Pre-K. Any time an older kid concept is brought down to Pre-K, I like to be extra thoughtful in how I go about it. Time concepts are very abstract for preschool children. They can’t see time, so it’s very difficult for them to understand. How often have you heard a preschooler use the word “yesterday” to refer to any point in the past? To a young child, yesterday can mean last week, last month, or even last year. To them, yesterday simply means the past. A preschool child might even tell you their birthday is tomorrow when it’s actually two months away. I think we should appreciate the fact that they have come to understand yesterday means the past and tomorrow the future. Then we throw in words like Tuesday and Friday, and those don’t mean past or future. This week Tuesday might mean a field trip and next week Tuesday might mean a puppet show. How does a 4-year-old child, whose understanding that yesterday means “past”, grasp words like Wednesday and March and Saturday and October? You can teach your Pre-K class to recite the days of the week and months of the year, but they don’t really understand what it means. I also believe that with Pre-K children, we should keep things as real as possible to help them make connections. That’s why I use a real calendar. I use a desk calendar and I always choose one that’s plain and simple because I draw pictures inside the boxes. Children may notice it’s the same or similar to calendars their parents use at home or in their offices. The emergency trucks and big trucks show days when those vehicles came to visit our school. Each day, I point out the block on the calendar that represents today, and I draw a diagonal line through it. The reason I do that is because that’s what a lot of adults do on their calendars, and children may notice those similarities between our class calendar and their parents’ calendars. Mainly, it marks the passage of time and shows that these are the days that are over. 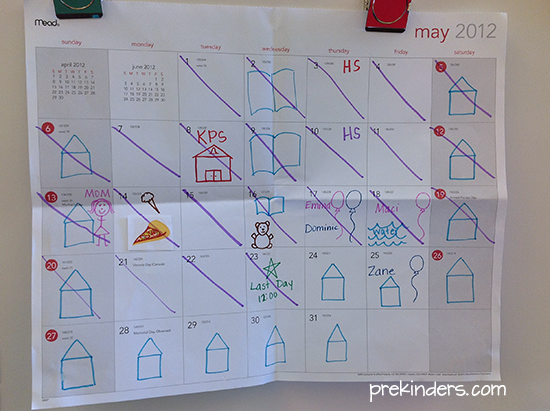 This calendar shows the day we visited Kindergarten, Mother’s Day, pizza party, teddy bear day, and water day. When we have calendar time in my class, I try to make it more like a casual conversation about our days together than a rote memorization routine. I casually say “Today is Tuesday” (or whatever day it is), but we don’t recite the days of the week. I don’t think they’ll grow up lacking this knowledge just because we didn’t do it in Pre-K. I don’t think they’ll fail Kindergarten, either. It hasn’t happened so far. I also don’t say “Yesterday was ___. Tomorrow will be ___.” Preschoolers don’t understand those concepts, as I mentioned above. 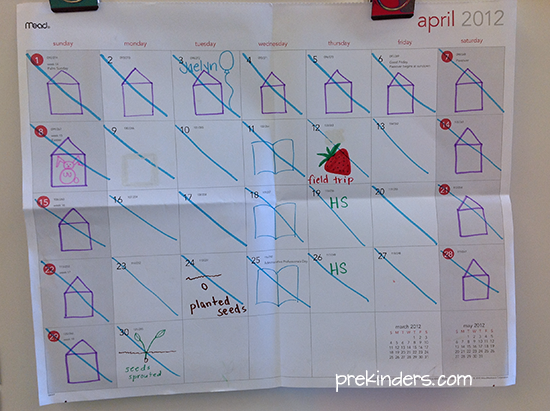 This calendar shows Easter, strawberry patch trip, and the growth of our seeds to plants. The most important part of our “meaningful calendar” is that I draw simple symbols on our calendar that represent events that are important to our classroom community. If we are going on a field trip to the strawberry patch, I might draw a strawberry. If our butterflies hatched from their cocoon, I would draw a butterfly. I draw a balloon with a child’s name to represent birthdays. I draw a house for “home” days. The book drawn on Wednesdays shows the class when the librarian comes to read to them. I draw symbols for holidays. We do talk about what happened yesterday, or what’s coming up tomorrow by looking at and talking about the picture symbols in the blocks. We might count how many days until a field trip or a birthday or how many days it took for our plants to grow. Sometimes I add stickers to represent something, but simple drawings are the best. You don’t have to be an artist. In fact, if it looks like a child’s drawing, that’s even better. Why? Because your students will see that making a calendar is something they can do, too! I save any old unused calendar pages and ask for donated calendar pages and the children use these to create their own calendar. They draw symbols on the squares and write letters and sometimes stick stickers on like I do. I print and make copies of small calendar pages and add these to my writing center for children to use. 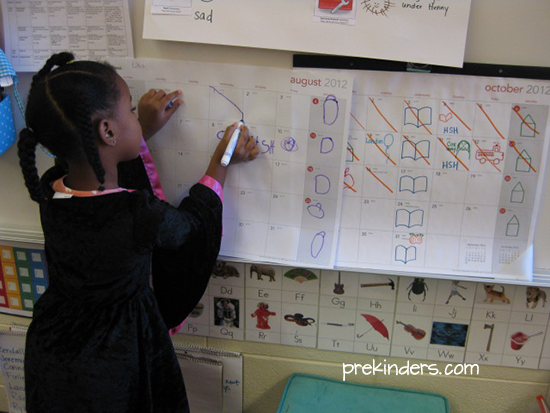 Our calendar can also show science concepts like the growth and change of butterflies or plants. 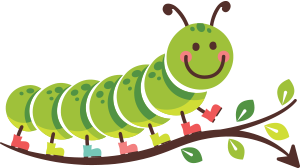 When our caterpillars arrive, I draw a caterpillar on that day’s block. When they form a cocoon, I draw a cocoon. When they hatch, I draw a butterfly. I once considered using a dry erase calendar, but decided to stick with the desk calendar because we have permanent record of our year together. I save all of our old months after I tear them off the desk calendar and we do refer back to them to remember all the things we’ve done through the year. 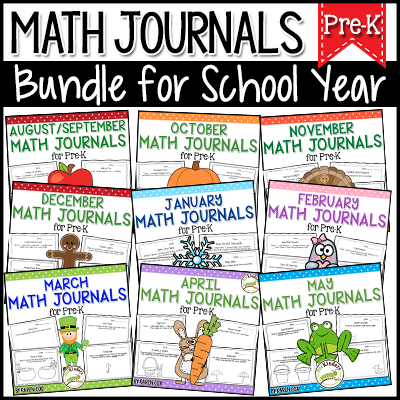 I also add free or dollar store wall calendars and planners to our writing and house centers. I wrote this in response to questions I’ve received about how I do calendar time in my classroom. I’m fully aware that not everyone will agree with me, and that’s fine. I believe this is meaningful and developmentally appropriate for 4-year-olds. I also highly recommend this NAECY article by Lilian Katz: Calendar Time for Young Children (PDF). If you do feel you need to teach children to recite days of the week and months of the year, I recommend teaching it through song. Dr. Jean and Jack Hartmann have some nice songs that teach weeks and months. My students leave my class familiar with the names of the days and months, but might not be able to recite them in order. Finally someone who understands how important it is to use calendar concepts that are developmentally appropriate and meaningful for preschoolers! Thank you! I really enjoyed reading this post, it also gave me ideas that I will share in my classroom. I also use blank desk calendar pages. I put red or green dots next to the numbers: green for school days and red for stay at home days. Important events get a yellow star on the day. Students take turns drawing a picture on each day during our calendar routine. Usually a face or stick person. Star days get a picture of the special event. We then skip count the number of the day. As you stated, the students have ownership of their learning throughout the whole process. 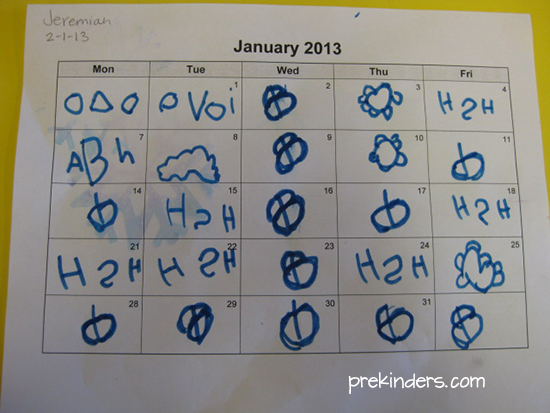 I use another blank calendar page to document the daily weather using simple symbols: sun, cloud, rain, snowflake, wind. At the end of the month we make a graph of the weather days. Again, students have control of the complete learning process..
Love your weather and graphing idea! So great! Thanks for sharing. We do Calendar the “calendar chart” way during circle-time but then revisit calendar at the end of the day where I bring out our journaling calendar where we write in the calendar square some of our favorite activities of the day or a child draws a representative picture for one their favorite moments of the day. Thank you for sharing this. I love the idea. I will share it with the lead teachers as an added item in the writing center. I really enjoy the way you use the calender in your writing center. That is something I have not thought of. Great idea that I’ll definitely incorporate that into my writing center now! Thanks for the inspiration. HI! Thank you for sharing your calendar time. I can’t wait to try it with my ECSE Pre-K class. I am going to print this out and show it to everyone I know – parents, teachers, licensing. LOL I have been sending children to Kindergarten for 25 years not counting my own 3 and my 3 grandsons. I have never had a child that didn’t do well because they didn’t know today, yesterday and tomorrow or couldn’t recite the days of the week in order or the months of the year. Half the time when they are naming the month for the calendar they are just as apt to call it “Monday” as anything else. I find the whole process tiring and time consuming with very little reward. I like your idea and plan to incorporate it. Mostly, I have just been writing the date on a chart tablet and listing any other important information for the day, and letting the children draw pictures themselves and if they don’t want to draw a picture they can write their name. This has been much less frustrating for me and for the children and it saves a whole lot of time to do something fun and interesting with the children. Those are some wonderful ideas. Thank you for giving us a peek into your classroom. I have always been frustrated with the idea of teaching 3 or 4 year olds the passage of time through a calendar. The concept is much too large. The desk calendar makes better sense and better use of class time. Thanks Karen! I’m always looking for meaningful and intentional activities with purpose! I so agree that time is a concept that is developing in preschoolers and the whole idea of days and months are just too abstract. I love this idea of using a real calendar that looks like the ones mom and dad may have at home or work. I have not been doing a calendar the last few years but will be giving this a try next week as the new month begins. Thanks so much for sharing and for sharing the journal article that supports this. Good grief! FINALLY someone who “gets” it! Thank you so much for sharing this wonderful information. thanks so much for sharing your ideas. as a new teacher, i find this site really helpful. I love it. Great idea, children learn so much more when they can participate and recognize things they see in school and have at home! I love the the calender idea ♥ excellent job. Thanks for the great outline. I think this is perfect for my younger kiddos but find my 4-5’s want to learn more. I keep more in line with literacy instruction M is for Monday etc. I love the examples you have too. Thanks. Hi Karen. I absolutely agree with this method! I used to focus on the days of the week song and “today is…tomorrow is,” but learned it was memorization and not at all meaningful. The past couple of years I have made the calendar more meaningful for the students, and it truly makes a difference. They count down the days until Christmas or a birthday and associate days with activities(Tuesday is Gym). I love the pictures of home on weekends, and will definitely be adding those! Thanks! Very interesting, Karen! 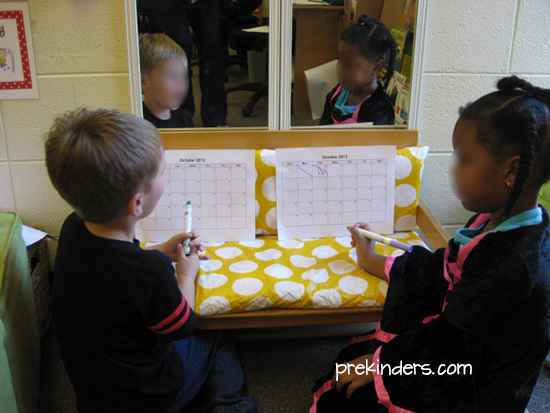 I teach my kids preschool at home, but it’s not structured like a preschool day, and I’ve never actually had a “calendar time.” My kids typically learn their days of the week by asking lots of questions and figuring it out on their own with a little help. For example: A family treat is that we have home made ice cream on Saturdays. So they’re always trying to figure out how long it is until then. 🙂 We count the days of the week on our fingers to get there. I have found that understandings about time slowly become clearer as they grow and mature. Thank you! I love this, days of the week is just memorization to children at this age it has no meaning. I begin the year with just 7 cards labeled with the days of the week in order, we move a clip each morning. we put a school or a home just to help understand when we are at school and when were not. We use this as a math activity as well. I add special events too! After about 6 weeks I replace this with a monthly calendar and we use it much more as a counting tool than actual “calendar” . I love the extra calendars in the writing and home living area! You rock! You are absolutely brilliant as usual! These ideas are perfectly developmentally appropriate in every way. Lillian would be proud. Thanks for your wise insights – I will use them with my pre-service teachers and college students. Thank you, thank you, thank you! I”ve been doing something very similar for the last few years and getting a bit of criticism for not doing the ‘tomorrow is, yesterday was’ bit, but it has no meaning for them. You’re right – sometimes their birthdays are “tomorrow” when really it’s not for a few months. We cross the days off on our notebook file, and add the important days (I like how you draw little symbols) and like how you reconnect at the end of the day – am going to borrow that idea! THank you for putting into words, what so many of us have been thinking and feeling for awhile. Very interesting. Enjoyed the article too. So many of my parents want their child to know not only the days of the week, but the months and the year! I will definitely rethink how we do calendar time. Thanks so much. I so agree with the way you do your calendar during circle time. I briefly do a calendar by just placing the number on the calendar, but no singing of the days of the week or the months of the year. We put a birthday hat on the calendar when it is a student’s birthday. I call my time “gathering time”. I like your way much better than mine. It goes better with everything I’ve learned over the years and have taught myself to other teachers! Thank you so much for the idea and information. When I watch the 2 year old and the 3 year old teachers make the children sit through this everyday, day after day, I want to scream with boredom right along with the kids. I chose not to use a calendar this year at all, but I do bend to pressure and we do recite the days of the week and months of the year. This is somehow seen as a measure of how ‘smart’ a child is when they can recite this back to adults. Maybe as we move into the school year a bit more I will think about incorporating your great ideas here. Thanks! Thank you Karen for being sensitive to the learning of pre-kinders. The idea of introducing the calender is awesome.It is an innovative way to learn the days and dates with pleasurable ease. Thank you so much for getting back to me on the calendar. This helps the children to relate to the calendar better. I felt lost with the calendar to my 4 year olds. I knew they were not understanding this part of my meeting board. Your way will make more sense to them. Love you for sharing….. Thank you for sharing the calender activity. I found it very interesting will try in our section. What a fabulous idea!!! I’ll be definitely incorporating these ideas into my calendar time. If only more would do it like this, they would keep the children’s attention so much more. I shared this with all my teacher friends. I love it!! Absolutely perfect….I love this idea, so developmentally correct and I am going to implement this asap in my pre-k class…Thank you for always having such great ideas!!! I love the calendar idea. It is still early enough for us to use this. I have been a Pre-K teacher’s assistant for 4 years and I am going back to school at 52 to get my Bachelor’s Degree and I love this idea. My lead teacher told me about this site and I already love it. That’s great. I worked as a Pre-k parapro for 15 years and went back to get my bachelor degree. I graduated in May 2013 at 49. I wish you the best of luck. Thanks for all you ideas, the calendars is really good ideas and the children likel. So happy to read a post about calendar time that is refreshing, reasonable, and embraces the developmental stage of pre-schoolers! I homeschool, and my son is now inf irst gread, and I realize how much we did not need to be doing with the calendar yet, and how much more fun we could have had in pre-K. It will be a little more fun for my daughters. Thank you! Thank you, thank you, thank you!!!!!!! I have hated calendar time for so long and so have always just focused on our daily schedule instead. Your way is so meaningful. Can’t wait to implement. I need to be more flexible this year and was looking for something new at the ‘calendar time.’ Love this concept. Brilliant! This makes so much sense! I can not wait to implement this in my fours class! Thank you! Thanks so much Karen this is just great. I agree with you, the children might recite the days of the week and say the months of the year but they do not actually have a concept of what they are. Your calendar idea is an ideal one for introducing such concepts. Keep up the good work Karen. I will certainly introduce this in our Pre-school classroom. I have never had my PreK kids recite the days of the week because it doesn’t mean anything to them. Everyday is Monday to them. I use a dry erase calendar that I can draw pics on and add stuff as needed but we do the AB pattern on it for marking off the days rather than crossing them out with a line. I am in total agreement with your views on how the calendar should be introduced to preschool children. Everyone knows children struggle with concepts of time and yet we spend so much precious time at circle time drilling the children to memorize them. Crazy! I usually just use a regular size calendar but will definitely get a desk size one now. Don’t know why I didn’t think of it before! Thanks!! I could not agree more. I teach preschoolers and this perfectly meets their needs with perfect approach to a calendar activity. I love the concept of using a real calendar with concepts that they connect with. Thank you. It is so refreshing to hear another teacher feel the way I do about calendar time. I get lots of teachers asking me if I do calendar time with 2 and 3 year olds and I say no, not yet. 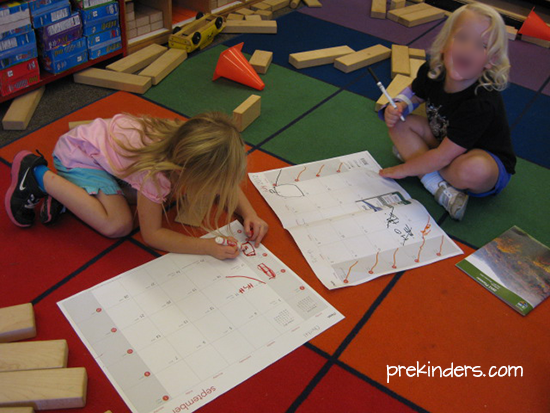 They are introduced to it in pre-K.
Love your ideas for using calendars with preschoolers. I think that I may try this in my own classroom. I have been a preschool teacher for 36 years and stopped doing the calendar 33 years ago because I found it to be developmentally inappropriate, boring, and a waste of valuable learning time. 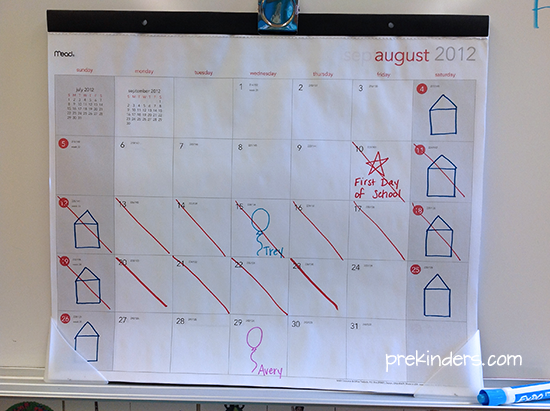 The traditional presentation of the daily calendar is fine in K and 1st grade but not in preschool. However, the way you have presented the calendar here makes more sense. I might even try it…maybe. I love this idea, and am glad you posted it. I have 3 and 4 year olds and they surely do not understand the days of the week. This is my new calendar idea for this year. THANKS SO MUCH! I plan to start homeschool/preschool with my son next week.. finding this on fb just now is going to save me alot of time and breath.. 🙂 I wasnt looking forward to singing the songs but we were planning to use a calendar add the day talk about the weather.. 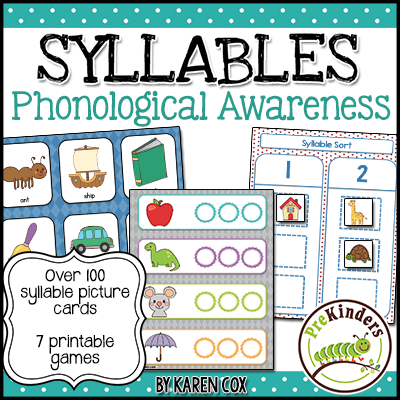 I always enjoy your site and get great teaching ideas for my preschoolers–thank you so much! Now I will incorporate calendar time your way and see how it works. Wish me luck! That is very helpful to me. We sing a Greg and Steve “Days of the Week” song. My students love it.. I do want to point out something that you said about butterflies. Caterpillars that turn into butterflies make a chrysalis. Caterpillars that turn into moths make cocoons. The way to tell the difference between a moth and a butterfly is a moth has a fat body and feathery antennae. A butterfly has a skinny body and smooth antennae. Also, butterflies land with their wings up and moths land with their wings down. Just thought I’d give you some science knowledge along the way. When I read The Very Hungry Caterpillar, I change cocoon to chrysalis. Thanks, I already knew that and always use the term chrysalis in the classroom. Just a slip. I was probably tired when I wrote it. Thank you for sharing! Love the idea! Great way to get the kids involved. I struggle with calendar time like many others. I am going to look for a simple desk calendar. My kids will love this. Thank you for sharing this with us. I have been adding the days every day, but I like how you use the desk calendar. My kids have learned the days of the week in the past but they do seem to have problems with recognizing the passing of time. I really enjoyed your post about the calendars. I used to be a strong believer in using a calendar until last year when i read the NAEYC article about making calendar time useful. I currently do not use it in my class and we only do songs about the days of the week, which is fun but they have no memory of the actual days. My director doesn’t understand the non-importance of the calendar when it comes to teaching young children; so i find ways around it lol! My children are paying more attention this year and can’t wait to try the symbols on the large calendar. Thanks for the reassurance. I just discovered your site yesterday and I love every idea I’ve read! I shared this site with my director and a few fellow teachers as well. I especially loved the concepts about anecdotal record keeping and purchased folders today. Thank you so much for sharing your knowledge and ideas! Great thoughts! I think it is adorable to see them mimic you by filling in their calendars. Now THAT is important. Love…thanks. This is great! I used to be a preschool teacher (now 4th grade) and agree with you that this way is far more developmentally appropriate than the more common way of doing calendar. This is pretty much just what I’ve been doing with my son with a calendar in his bedroom, and it has really helped him to understand when mommy and daddy are going to be home with him, when special days are coming up, etc. I love the idea! We are required to do this in our classroom. However, it is very time consuming. I will try it your way. I will certainly share with the other teachers. Thanks! I appreciate this approach to Calendar math, etc. I do the traditional yesterday, today, tomorrow, but this Fall, I have adopted having the children complete their own calendars. The reason you mentioned that they simply do not understand the concept, no matter how often we recite it. I think your approach is refreshing and about what’s best for the education of the children. Nice post. I’ve been doing this with my own children for a couple of years in a similar manner. We mark birthdays and holidays and I write things for myself as well like doctor visits, play dates, etc. They may not always know the days of the week, but I find it very helpful in understanding the difference between tomorrow and next week or next month. My daughter is 5 and in kindergarten this year, so I have started incorporating ideas like Monday is the beginning of the week, after the weekend is over the week is done and we start a new week. It helps with questions like can I go to grandma’s house today, or have a friend spend the night (those are weekend things) it also helps me stay organized with school events and making sure we don’t miss fun events at the library or rec center. Mine are 3 and 5 now, so obviously the 5 year old understands a bit more, but my 3 year old still benefits from knowing what things are coming up and they take turns crossing off the days. This article is very helpful. Takes a lot of pressure off! As always Early Childhood educators Rock! You nailed it on the head! I really like your calendar time Karen. I have found my TK students do have difficulty understanding the passage of time. I want to try your idea! I absolutely love this idea! I have ben wanting to make calendar time relevant to my Pre-K Class. I started this Sept. and my group really enjoys reflecting on the days at school and the “home ” days. Also, when something significant happens (liking finding a praying mantis) they want me to draw it on the corresponding space. THANK YOU , KAREN. I love this I work with 3yr olds and this is such a great idea. Thanks so much for every thing you share!! I’ve been teaching kindergarten for 19 years and have always used a “real” calendar for these same reasons. I make one every year out of 12 sheets of white poster board and a sharpie and yardstick! It takes a lot of time, but it is so much better than using a cutesy teacher calendar with Apple cut outs etc. This is a REAL calendar used in REAL ways. We teach reading and writing authentically, so why not this, too! Yes! I so agree with this. 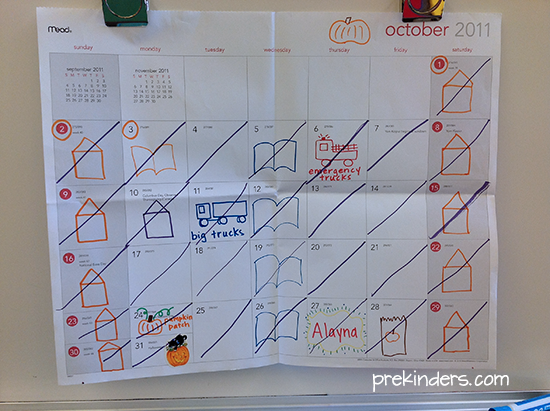 I gave up our BIG learning calendar for a real calendar this past fall. Thank you for this information.I’m a new teacher for Head Start. I had started to do the traditional activities with a calendar, we were told that Head Start will not support calendar activities next year. However I love your ideas, and I appreciate your explanations. Thank you. Great post Karen! We use a real calendar in our classroom. The children loving seeing their birthday get closer and closer. I’ve been teaching PreK for over a decade now, and I like doing songs for days of the week, months of the year. I talk about it, and of course some kiddos get it and others don’t. But I’ve introduced it and it’s there in their brains and they can pull it out when they are ready. I do like to make them meaningful and I’ve always put picture cards up for special days and events. I like the idea of the real calendar because man, I’d love to get rid of all the fiddly little number cards! Great idea. I think I will use it and record weather also. Thanks! I used this idea last year in the classroom. I drew balloons on the child’s birthday, a house on days were were out, a family on parent meeting, names of visitors and etc. the children in class could tell what was happening and when. Great idea! Thanks for sharing!! I love this! The only thing i mention in our Circle time is the actual name of the day. I write it in our morning message. Among other things, I write “Today is” in black and then use a specific color to write the day. This way the children always relate the blue word (or whatever color you choose) as the name of the day. They seem to like it! Hi! Thank you so much for all your comments and suggestions, they are all very usefull, however, my teaching is a rare mixture between your advices and my own experiences. I am an English teacher in México City, and many of the great things you post, I have do adapt them to my reality and also to my studenst needs. Thank you again and I hope you can post more about teaching English to Speakers of other languages. Thanks for the great post! Now in my own little home preschool, this is how I do calendar time as well. I was always conflicted when working at centers/preschools that required a long and intense calendar/circle time — it bored me, so I can only imagine how the children felt! I knew they had little understanding of what was being “taught.” I’m glad you are promoting this approach. I decided to try this concept this year and love it! It felt funny at first because I wasn’t doing it the way I had been for so many years, but the children love the calendar. The one thing I did was put Saturday and Sunday at the end of the calendar which made it easier for them to see the two days they stay home. We recently had Labor Day weekend, and everyone knew we had a special three day weekend. This also helps my special needs friends transition back on Monday. Thanks for the great idea! Hi! Do you pre draw your symbols on the calendar or do you draw as you go. Love this idea and will be using this at the start of school. Most are pre-drawn. If something new comes up to add to the calendar, I draw it then, but anything I know at the beginning of the month, I go ahead and draw it on. I also sometimes print out clipart to glue onto the calendar.